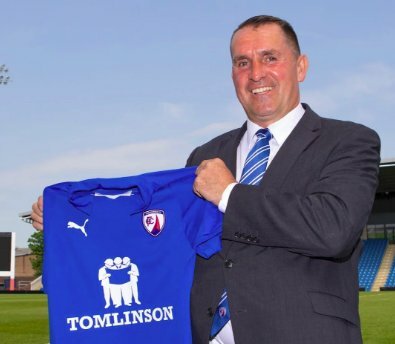 Martin Allen is the new Manager at Chesterfield. A tenacious midfielder with QPR, West Ham and Portsmouth. Martin began his management career at Reading. He has had spells at Brentford, Milton Keynes, Leicester, Cheltenham, Notts Co, Gillingham and Eastleigh. Oh yeah and he has managed at Barnet on 5 separate occasions over a 15 year period and probably will again someday. He joined Chesterfield in the summer. The M1 until Junction 29. At the roundabout take the second exit signposted Chesterfield A617. After approx 8 miles of dual carriageway keep right at a roundabout and take the A61. At the next roundabout, with a very large Tesco's take the first exit (stadium signposted at this point) into Lockford Lane. At the next roundabout take the 3rd exit B6057 (Sheffield Road) and you will see the stadium. Chesterfield Station is a goodly 30 minute walk from the ground. A taxi always wins when confronted by these circumstances in my opinion. Leave plenty of time as roads to the ground are very congested on match days. The adjacent retail Park has the normal array of Hooded Fried Chicken's and McMobiles type eateries. Inside the ground food and drink is reasonably priced but pretty run of the mill football fare. 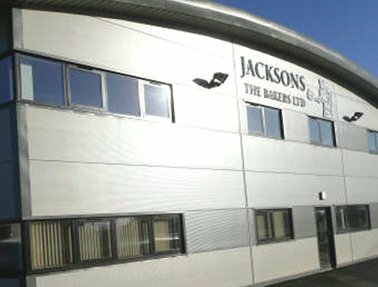 The Jacksons range of pies on offer are championed by the club and supporters. The Spireite pub close by welcomes all and has numerous real ales. The Derby Tup is another local with good beers and is close to a rather decent Fish and Chips according to my spy called the Mermaid. 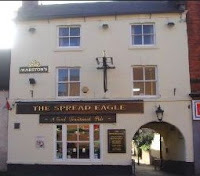 For those with time on their hand the Reckless Recommendation is The Spread Eagle Pub, 7 Beetwell Street, Chesterfield, S40 1SH. 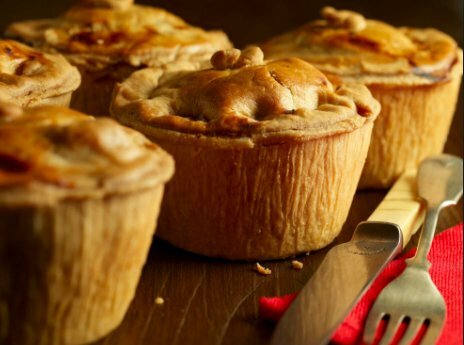 This little place comes highly recommended by my contacts – Home made Steak Pie or a very agreeable Curry. 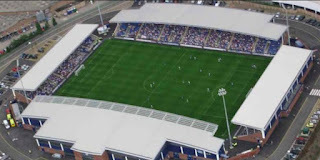 The stadium is a new state of the art arena and has a capacity of 10,400. It cost £13,000,000 to build and opened in 2010. The ground consists of 4 stands the HTM Stand (Main), Spencers Solicitors Community Stand (East), The Rubicon Print Stand (North), and the Karen Child Stand (South). Visiting supporters are situated either in the North or more likely in the East depending on numbers. Out is the character and homeliness of the old Recreation Ground (whose exterior and interior was cleverly disguised and utilised for the Brian Clough biography film Damned United) and in is the clean lines and efficiency of the 21st century. The viewing lines are however exceptional and the stadium has all the mod cons that supporters have come to expect from a new football stadium. Our last visit was in December 2016 when a John Akinde goal was not enough is a 2-1 defeat. We were honoured to be the first competitive opposition at the new stadium in August 2010 when 6,431 saw the Bees lose out 2-1 with the only cheer a goal by Glen Poole. 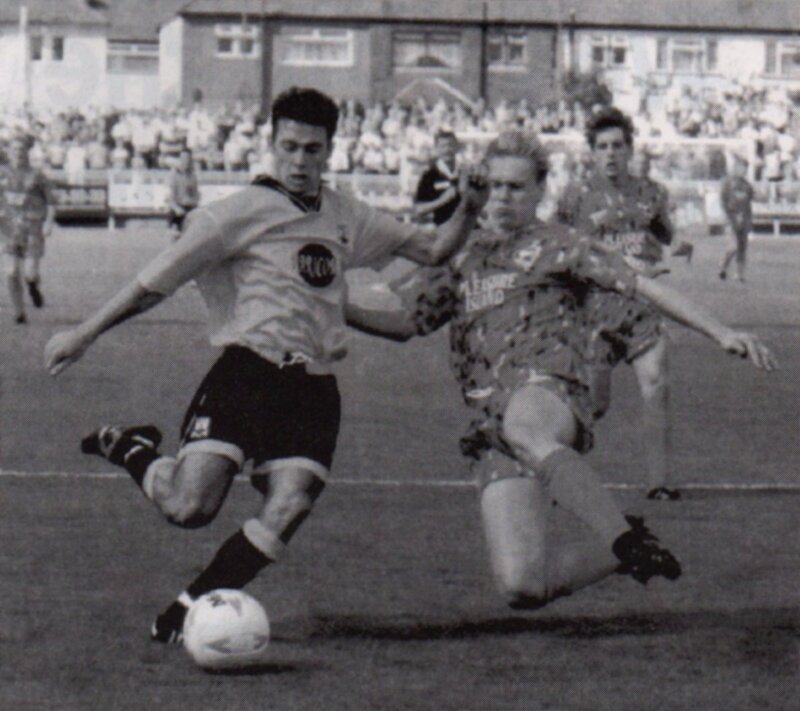 Back at Saltergate - In 2000 goals from Robbie Sawyers and King Kenny Charlery were enough in a 2-1 win. 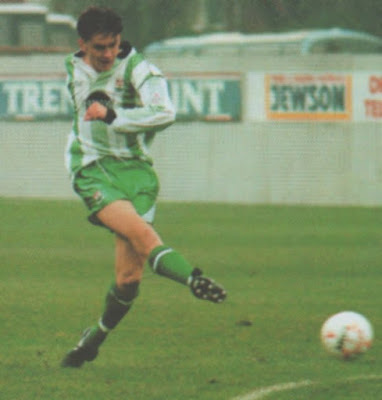 A Gary Bull brace bought home the spoils again by 2-1 in 1991 but the highlight of the duels for me personally was Dougie Freedman’s, admirably aided I must add by Gerry McMahon, majestic performance at Underhill in October 1994. Dougie scored two in a 4-1 win that frankly didn’t tell the whole story of a wonderful Bees performance. In 1997 Chesterfield reached the FA Cup semi final losing to Middlesbrough in a replay but not before a most controversial refereeing decision occurred in the first 3-3 draw at Old Trafford. With Chesterfield leading 2-1 Jonathan Howard’s shot clearly crossed the line, and this was confirmed in TV replays, but Referee David Elleray ruled it to have not. Had the goal stood the club would have been in the final of the FA Cup for the first time in its history and accomplished a feat which no club in the third tier of the league has achieved. 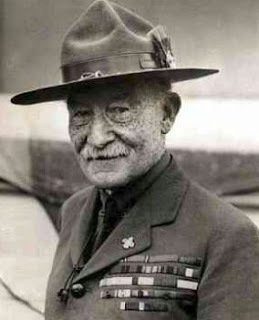 The late actor John Hurt CBE was bred in Chesterfield as was Olave the wife of was Lord Robert Baden Powell, the founder of the Boy Scout Movement and Grandfather of "Paddy" and The Rt. Hon. Baroness Barbara Castle MP. 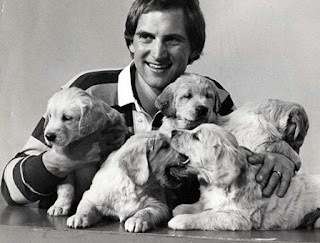 Two Arsenal goalkeepers Bob Wilson and John Lukic are also from these parts. If you are just looking for “fillers” for your autograph books then ex Blue Peter presenter Simon Groom can often be seen wearing his Spireites badge proudly along side his gold Blue Peter one. Also you may bump into Princess Diana’s ex-Butler and The Queens ex-Footman Paul Burrell. Fred Davis Snooker World Champion when the balls were in black and white is also from Chesterfield.